A gardening trend that has grown in popularity over the years, the lovely terrarium is a glass vessel that can be placed both inside or out and is perfect for your stylish loved one. 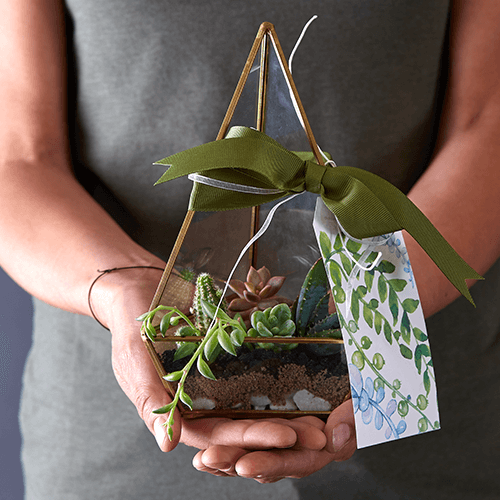 Buy a terrarium online, or try your hand at our fun and easy terrarium DIY project. Hanging plants are great for friends or family with small spaces. Go for the uber-trendy macramé hanging pot, or if you’d prefer to add a personal touch, arrange your own selection of plants in the Jacinta hanging bowl. Perfect for your less green-fingered friends, or someone who is constantly out of town, the popular kalanchoe is fairly easy to maintain and thrives in bright, natural light. Gift it in a red and white pot – the perfect colours for the festive season. We love these one-of-a-kind miniature succulent animal planters that will add life to a drab space. There are many more variations available in-store at your nearest Stodels branch, as well. This Ficus ginseng is a great starter Bonsai. Go the extra mile by gifting it with a printout of our Bonsai care guide, or any of the Bonsai tools available in-store. You can’t go wrong with a brightly-coloured plant for your loved ones who needs a little cheer in their lives. The anthurium is low-maintenance and looks dashing in a red and grey pot. This miniature 4-piece garden tool set is a fantastic garden gift set for a budding young gardener this Christmas. Put it to good use with our DIY gumboot garden activity. From as little as R350, our ‘consultants on call’ will give your loved one an hour’s consultation, a R200 gift voucher and a free quotation. Well-suited to the friend or family member looking to do up their garden in the new year. The gardening hand tools is a cute gardening gift for someone who is into gardening in pots. Create a beautiful gift basket by pairing with gardening gloves and a garden hat. Not sure what they need? Indulge your loved ones with a Stodels Gift Card that will enable them to choose their own green gift for the garden.